Lachha paratha recipe – the layered paratha that goes perfect with any curry dish or as a breakfast with pickle. The texture of this lachedar paratha is crispy, flakey yet soft. This is the BEST recipe and makes PERFECT laccha paratha. Here I have used mostly whole wheat flour and very little all purpose flour. But to make it more healthy, you can replace the all purpose with wheat flour. Here I have added milk while making the dough. Milk makes the paratha really soft and melt in your mouth texture. Making this at home is little time consuming compared to the regular paratha. But of course not that tricky at all. The below step by step photos will make it much easier for you. I have eaten this lachha paratha at many restaurants and those are loaded with oil or ghee. So I prefer those ones occasionally. But hubby likes it so much that I have tried making this at home. Also I have reduce the amount of oil quite a bit. Still the texture is perfect flaky and soft. You must give it a try. 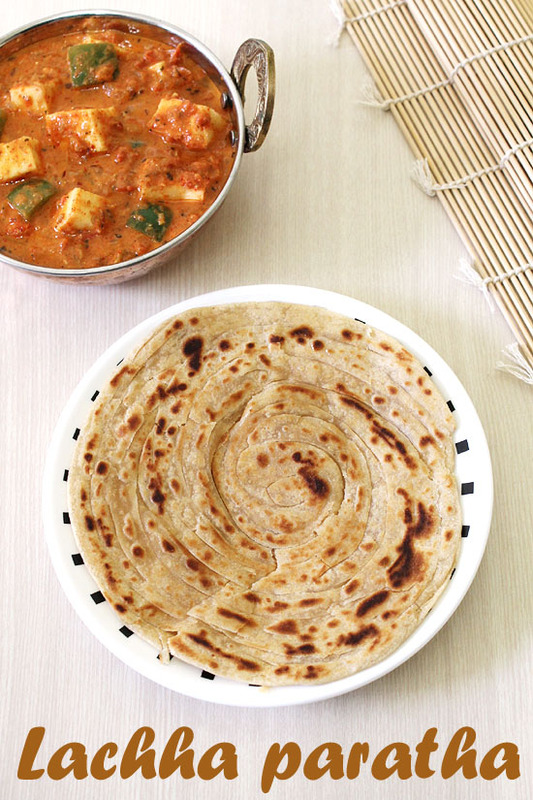 This lachha paratha recipe is inspired from Sanjeev Kapoor’s recipe book. 1) First we will knead the dough. For that purpose I have used food processor. You can do it by hand just like any other dough. Take both flours (whole wheat and all purpose flour), salt, sugar. Drizzle 1 tablespoon of oil. Pulse it couple of times till everything is incorporated. If doing by hand use your fingertips. 2) Now add milk and water. If doing by hand then add little at a time and keep kneading. 3) pulse it till it come together like a dough. 4) Dough should be soft and smooth. Cover it and let it rest for 15 minutes. 5) After resting time. Knead it one more time to smooth out. Then divide it into 10 equal portions. Make smooth balls and flatten it between your palm one by one. Work with one disc at a time. Dip into dry flour. 6) Start rolling using rolling pin. Roll out in a large circle of 10-12 inch diameter. If it is not proper circle, still it is fine. 7) Now apply ½ teaspoon of ghee all over it and sprinkle little flour. 8) Now start folding and pleating as shown here. Make sure to make small pleats which gives more layers. 9) Keep pleating all the way, it will be like a folded paper fan. 11) Now start rolling into spiral form. 12) Press the end to join together. Keep it aside and do the same with rest of the balls. 13) Now take one spiral disc, dust it lightly with flour and start rolling. Do the rolling part with gentle pressure. Roll out into 7 inch diameter circle. It should be of the medium thickness. 14) heat the tawa on medium heat. Once hot place the rolled paratha on it. After few seconds you will notice bubble on the surface. 15) That time flip the paratha and cook the other side for few seconds. Then apply oil on the surface. 16) Flip it and cook by pressing gently using spatula till the bottom side has light brown spots and no more uncooked doughy part seen. Again apply oil on this surface. 17) Flip and cook the other side similarly by pressing with spatula. 18) Once done remove it from the tawa. Now carefully, crunch it slightly using your hands to separate the layers. Be very careful not to burn yourself from the steam. Serve directly to the person’s plate or store in insulated container (which is lined with paper towel to absorb the moisture from heat). Repeat the same rolling and frying process for rest. NOTE: Always keep the thickness of the lachha paratha to medium. If it is rolled to thick then it will take too much time to cook. If it is too thin then it won’t have that good flaky texture of the layers. Serving suggestion: This lachha paratha can be served with any gravy dish aka curry as a meal. It can be served with dal fry or dal makhani too. For serving it as a breakfast, have some mango pickle or chutney on side. In a bowl, mix all purpose flour, whole wheat flour and salt. Drizzle 1 tablespoon of oil or ghee and mix using fingertips. Now add milk and water to knead into a smooth and soft dough. Cover it and let it rest for 15 minutes. Then knead again two three times to get the smooth dough. Divide the dough into 10 equal portions and make smooth balls and flatten between your palm one by one. Dust one disc using dry flour and roll into 10-12 inch diameter circle. Apply 1/2 teaspoon of ghee or oil on top and sprinkle little flour. Now start folding and pleating all the way. Then by holding two ends, swing and tap on board to stretch it slightly. Now roll into spiral like swiss roll. Make all the rolls similarly. Now dust one roll and using rolling pin roll into 6 inch diameter circle. Once done remove it from the tawa. Now carefully, crunch it slightly using your hands to separate the layers. noted. I will try to add more description. btw very happy to know everyone enjoyed. Thank you for the review. There are two more ways I got to know from somebody other than pleats, quite easy. Where shall I send you those? 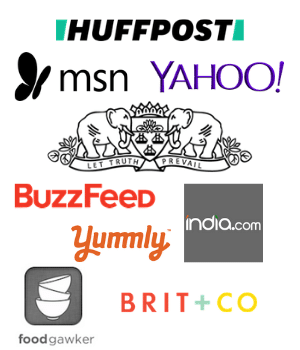 u can add them on ur blog. There is no option to upload a pic on the blog. But if you want you can message me on my facebook page. Thank you….I have been making these at home however the recipe I used did not use any milk..I shall surely this method to see the difference. ….plus the pics was an extra bonus demo…..
Hi kajal, sure give it a try. I use food processor almost every day for making dough whether its for paratha or roti. For the family of two, I have written exact measurements in notes, so my husband can also just dump all the ingredients and make dough. He doesn’t have to be skilled. So it helps me a lot. But if I am making the dough then it depends on the mood, sometimes I do by hand and sometimes use the processor. If you are used to by kneading by hand, its up to the personal preference. Other than this, occasionally I use this for grating purpose for making gajar halwa or pumpkin halwa. Also sometimes, I use to make salsa, or for coarsely grinding tomatoes for pav bhaji or rajma gravy. So at the end, it depends how much you are into cooking and think where you will use this gadget in your cooking lifestyle. aks a question, is it worth buying and decide. Hi kanan, excellent blog. I check your blog for any recipe first as you r doing it like a scientist who is particular about precision. Thank you! Glad to hear that site and recipes are helpful to you. Yes that is true, I always prefer the precision over ‘andaaz’. For beginners or first timers, eyeballing things can go wrong. Experienced person can go for andaaz method.